Stephanie Kadison (center) and her students at Bard High School Early College Queens. Kadison provided insight into RockEDU Online’s development. After years of running on-campus workshops for New York City’s educational communities, the RockEDU Science Outreach team has accrued a rich portfolio of science education materials. With the launch of a new website, RockEDU Online, these resources are now available for learners, educators, and scientists everywhere. The site was created considering the challenges and limitations of participating in science education activities outside of traditional laboratory settings. 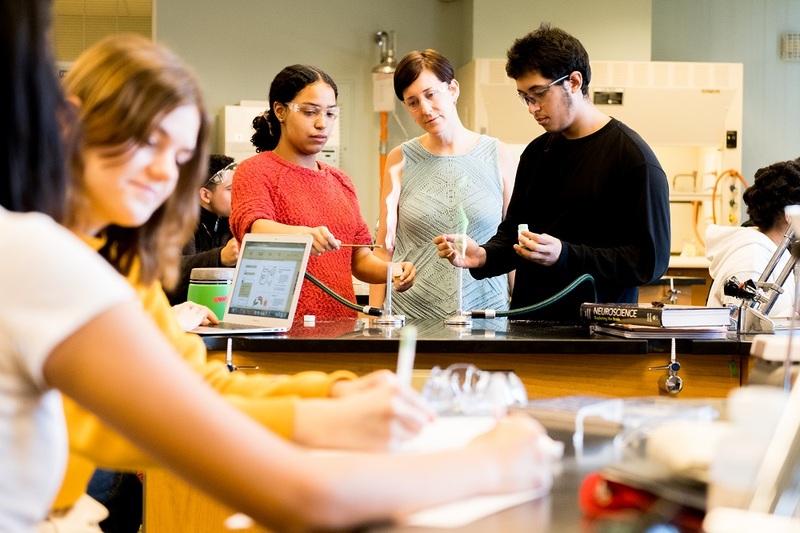 RockEDU Online provides creative and well-designed resources that educators can incorporate to enhance their science education practice—including lab experiments, demonstrations, and discussion topics—as well as a Guide to Outreach where scientists can learn about effective tools and strategies for participating in science outreach. RockEDU has developed many of the materials on the site in collaboration with Rockefeller scientists, New York City teachers, and fellow outreach professionals. The site was designed by C&G Partners.